Every summer when my family’s blueberry farm opens for business (and believe me, I am counting the days!) the first thing I look forward to doing is eating those enormous, sweet, delicious berries fresh from the bush. The second is eating a enormous, sweet, delicious cone of home churned blueberry ice cream they make at the farm. It is pure, creamy and wonderful. Smooth save the lone whole berry straggler here and there. This last fall, shortly after I finished the last of the farm-churned ice cream I had a wave of longing for the flavor of summer & family tradition. I started flipping through cookbook after cookbook looking for a recipe that might come close to the wonderful ice cream I was used to. Finally I came across this ice cream recipe. While it’s not a replica of the farm’s ice cream (I’m guessing that’s a closely guarded secret- dang it!) it was enough to tide me over until July when blueberry season rolls around here again. 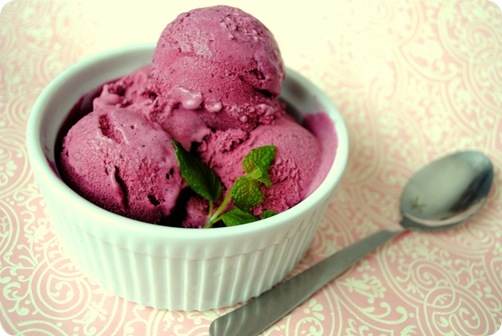 The sour cream gives it just the tiniest bit of tang and the berries give the ice cream that gorgeous purple color. Directions:In a medium sauce pan bring the blueberries, sugar, salt, lemon zest and lemon juice to a boil. When the mixture is boiling and the berries burst, about 3 minutes, remove from heat. Pour the mixture into a blender and puree until relatively smooth (it will never be completely smooth). Pour the heavy cream and sour cream into the blender and mix until combined. Transfer the mixture to a bowl and chill completely in the refrigerator. Pour into the bowl of an ice cream maker and churn according to manufacture instructions. Freeze in an air tight container. That looks so good. I love tangy fruit ice creams. This looks like a winner recipe. Now I only have to get an ice cream make and I will be all set. I'm with you! Every time my mom calls my aunt & uncle that own the blueberry farm she asks "how are my blueberries doing"? Thank you Charissa! I'm craving summer too! You can make ice cream without an ice cream maker! After you put the mixture in the fridge to chill move the bowl to the freezer for 30 minutes. Remove & whisk it with a spoon several times. Put it back in the freezer and repeat in 30 minute cycles 3 times. Then let it freeze overnight! 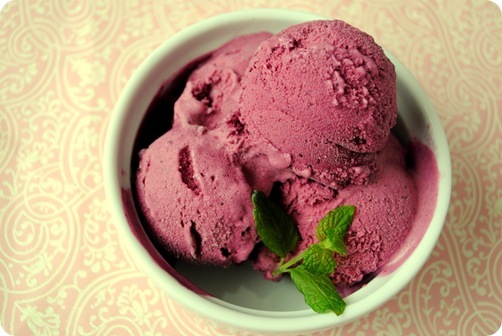 I have a thing for purple ice cream, and also love sour cream. This looks delicious- I wish I had an ice cream maker! No need for an ice cream maker! You can make ice cream without one! After you put the mixture in the fridge to chill move the bowl to the freezer for 30 minutes. Remove & whisk it with a spoon several times. Put it back in the freezer and repeat in 30 minute cycles 3 times. Then let it freeze overnight! I'm wondering if putting the blueberry mixture through a very fine sieve might make it smoother. Blueberry seeds are tiny, so probably not, but .... the color is absolutely gorgeous. Plan to make and serve in vanilla tuille cups. It couldn't hurt. The end result once frozen is still pretty smooth but you could certainly take it the next step and pretty smooth. I made this a couple weeks ago and it is absolutely amazing. I think the sour cream provides a great tangy flavor. I thought strawberry gelato was my favorite - but now I know this ice cream is! Great recipe! If this is anywhere nearly as good as the strawberry sour cream ice cream that I made from a similar recipe it should be absolutely awesome! I've made the strawberry sour cream ice cream also and.... it's a toss up! This was the best ice cream I think I have ever had, ever! I used fresh blueberries picked that morning. Thank you!